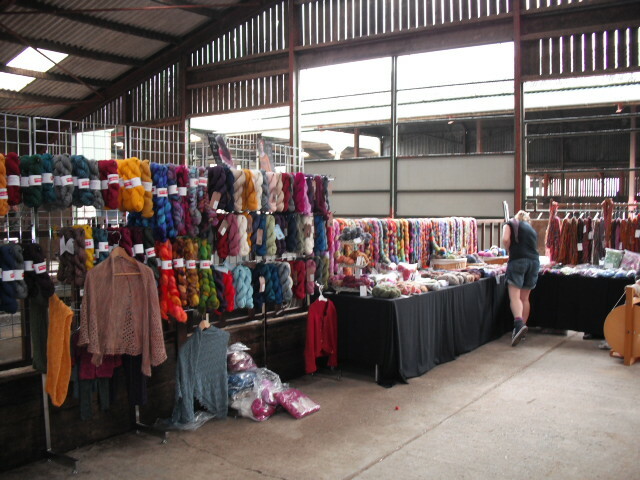 Last weekend I was lucky enough to go to a very exciting event with some of my friends from Stash, the Bluefaced Open Weekend, (or ‘Andyfest’ as it has become known on Ravelry!). Now I know some of you will be thinking ‘More yarn and knitting things? What a busman’s holiday!’ and while I suppose you may have a point (and I did see and chat to lots of lovely Stash customers – it was lovely to see you all!) I did thoroughly enjoy myself, and of course, I may have sucumbed to temptation/been weak willed bought a small cough amount of yarn, purely for ahem, research purposes, you understand. One of the many things that were really nice about Andyfest was the relaxed atmosphere. There were stands from Easyknits, Posh Yarn, The Natural Dye Studio, Fyberspates, The Knitting Goddess, Nicsknots, Babylonglegs, Felt Studio, Ann Kingstone and Laughing Hens but nothing was too crowded and there was plently of space to sit and chat with a cup of tea and a piece of cake in between stroking yarns! These stunning blankets from the Natural Dye Studio are in Amanda’s new book ‘Into the West’. My favourite one was the rainbow graduated one next to the yarns, Rita. There were some gorgeous yarns on the Fyberspates stand, and I may have had a moment of weakness/madness and bought 3 skeins of absolutely divine Fyberspates Faery wings, which is to die for. 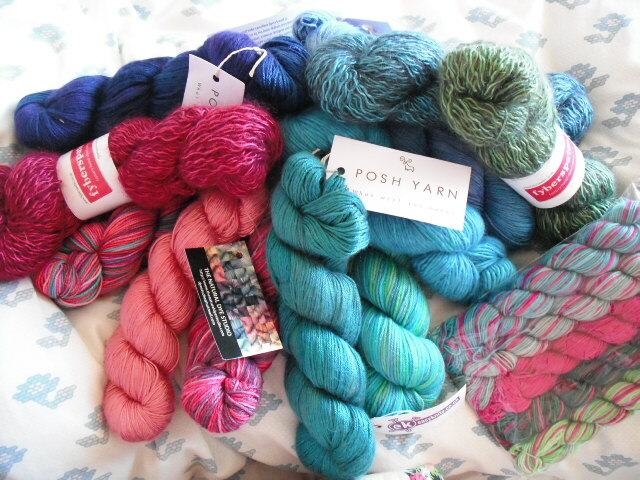 And at the end of all this I came home with a lovely pile of gorgeous yarns! Fyberspates Faery wings, Posh Yarn Natasha and Sylvia 4ply ‘orphans’, Easyknits Twinkle DK and 4ply, Cloud and Biffle-Boo, a pack of Mini skeins in Flower Power from The Knitting Goddess, and a skein of Precious 4ply from the Natural Dye Studio……. 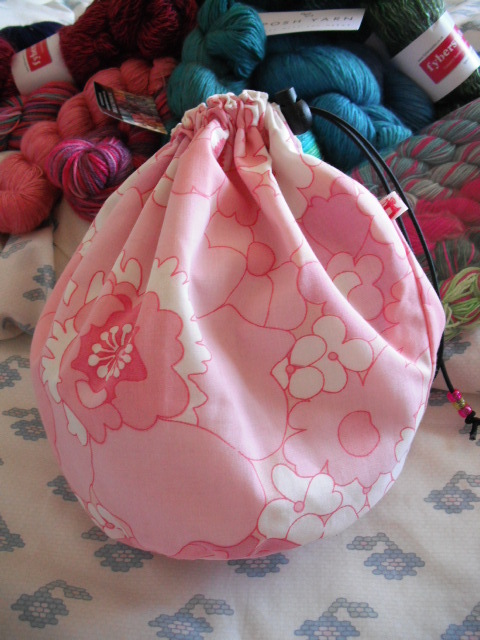 Fabulous Nicsknots project bag – big enough to hold even a sweater WIP! ….and a bag from Nicsknots to put it all in (well, maybe not all at once!). Did any of you go to ‘Andyfest’? What did you get? Get £1 (GBP) off Moon River until 00:00 GMT on 1st October 2012! « Because I love you…. 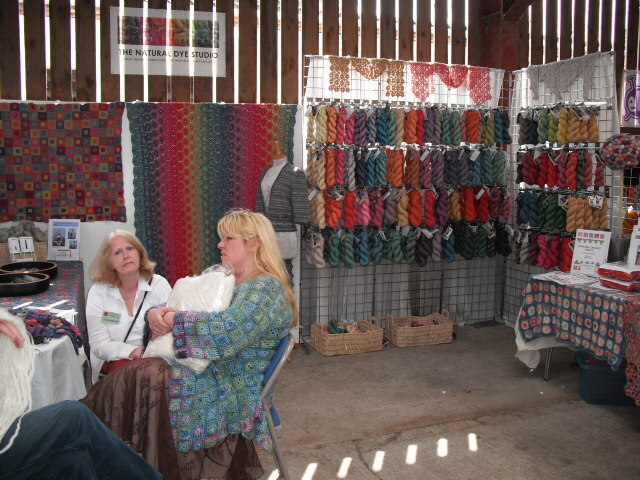 I went for the first time, It was fantastic all those lovely yarns – so many that I had to circle so many times just to decide what to choose. I decided on some blue faced leicester undyed and a treat for myself for once some dk merino dyed raven from babylonglegs. Its lovely and has a sparkle to it. Being addicted as soon as I got home I had to cast on my fingerless gloves. Now waiting for the colder weather to show them off. Can’t wait for next year. Ooh sparkley yarn, sounds lovely! I can’t wait for next year if they decide to do it again either! Ahem, a LITTLE yarn? Looks lush! Wasn’t posh yarns orphan table amazing?!?! The Posh orphans table was amazing wasn’t it? To be honest, I could have spent a thousand pounds without blinking (had I had it!). Oh, it was lurvly!